I wrote this story with journalist Alfredo Corchado. It was published on Jan. 22, 1998. HAVANA – Pope John Paul II, an unrelenting anti-communist, arrived on the Western Hemisphere’s last Marxist outpost Wednesday, shook hands with Fidel Castro and told Cubans to “not be afraid to open your hearts to Christ. ” “On this apostolic journey I come in the name of the Lord to confirm you in faith, to strengthen you in hope and to encourage you in love,” he said. “I am here today to share with you my profound conviction that the message of the Gospel leads to love, commitment, self-sacrifice and forgiveness. A people that follows this path is a people with the hope for a better future.` John Paul, 77, credited with inspiring the fall of socialism in Eastern Europe, is the first pontiff ever to visit the Caribbean island. His unlikely host, Mr. Castro, 71, had in recent days lashed out at those who have sought to make politics part of the historic visit. Then minutes after the pope arrived, the Cuban president did just that, condemning the U.S. ban on trade with his Communist regime. In a veiled reference to the American embargo, Mr. Castro said the “total economic suffocation” his country is suffering at the hands of the mightiest superpower ever known is a bid to destroy his people. The pope didn’t explicitly criticize the trade embargo during Wednesday’s welcoming ceremony but said, “May Cuba, with all its magnificent potential, open itself up to the world, and may the world open itself up to Cuba. ” Many Cubans believe the encounter between John Paul and Mr. Castro could trigger economic and political change on the island. Economic conditions have been grim there since the collapse of Cuba’s benefactor, the former Soviet Union. “The pope comes at a time of great uncertainty and of profound concern for the future,” said Enrique Lopez Oliva, a religious scholar at the University of Havana. “He will have his hands full because this isn’t Poland, or Chile. This is a much more complicated, less predictable place. This is Cuba and I don’t think he has any real idea of what to expect. ” Said Maria Iglesias, a Havana expert on religion, “The key will be how Cubans react to whatever his message is. ” Last-minute work The Cuban government has been preparing for the visit for more than a year and the labor went on until the last minute. Workers frantically replaced street lights, painted buildings, spruced up parks and paved streets in Havana and three other cities the pope will visit during his five days in Cuba. The pontiff’s plane touched down at Jose Marti International Airport just after 3 p.m. Dallas time. John Paul was greeted by Mr. Castro. With a cane in his right hand, the pope walked slowly to a group of four children, who presented him with a tray of Cuban soil. John Paul bent down and kissed the soil, a sampling of earth from each of the island’s 14 provinces and the Island of Youth, just off Cuba’s shores. “I am filled with happiness to be able to visit your country, to be among you and share these days of faith, hope and love,” he said later. In his speech, Mr. Castro searched for common ground with the pope, saying they each have made it a lifelong mission to protect the poor, weak and defenseless. “We think the same as you on many important issues,” he said. Mr. Castro, who went to Catholic schools as a boy, also had some criticisms, chiding the church for discriminating against blacks and the poor before the 1959 revolution. “In some of those schools for the wealthy and privileged, it occurred to me to ask why there were no black children there,” he said. “Even today, I have not forgotten the unconvincing answers they gave me. ” The pope responded with a mild complaint about the lack of religious freedom in Cuba. Until last month, the government had not officially recognized Christmas for nearly 30 years. “The church in Cuba has always proclaimed Jesus Christ, even if at times she has had a scarcity of priests and has had to do so in difficult circumstances,” John Paul said. His words were stronger in remarks made en route to Havana; he was concerned not only about human rights violations in Cuba but the American government’s hard-line policy toward the Castro government. Tears of joy Once in Havana and on his way to his accommodations, he was greeted by hundreds of thousands of people. The crowds, many enjoying a paid day off and encouraged to greet the pontiff, lined the streets of Havana as he rode in his Popemobile. Arisleyda Melo, 24, couldn’t stop crying. “Tears rolled down my face the minute I saw him walk off the plane. I couldn’t help it,” she said. “And every hair on my body stood on end, from head to toe. ” Her friend, Annette Amigo, 19, tried to explain. “For us, having the pope here is like getting a visit from God,” she said. “We never imagined he’d come. ” Others along the 12-mile route from the airport sang as the pope’s entourage sped by. “I’m here because I’m a revolutionary,” said Eduardo Gonzalez, 40, a carpenter. “And I didn’t want to miss this. ” Mr. Castro and other Cuban officials had been urging the populace to show up en masse for days. Posters, banners, stickers and even refrigerator magnets of the pontiff’s image were passed out all over Havana. Pope postage stamps were issued. Pay phones were installed. Security was extremely tight in the capital, where there has been a string of bomb blasts in the past year. With the pope around, Mr. Castro is reported to have said, “not even a light bulb must explode. ” The Cubans have paid special attention to American visitors because they believe the bombings were planned by Mr. Castro’s foes in South Florida’s Cuban exile community. Some Americans say they were forced to leave the country to make way for the more than 3,200 foreign journalists coming to the island. “Everybody’s paranoid,” said Ned Walsh, an American who led a delegation that brought $20,000 in humanitarian medical aid to Cuba earlier this month. “We were forced out of the country on Jan. 5. The Cubans said it was because of security concerns. ” And while Cuban officials deny they were forcing people to leave the country, they defend their security measures, saying both Mr. Castro and the pope have been the target of assassination attempts. Cuban dissidents say state security agents began rounding up prostitutes, gays, beggars and others weeks before the pope’s arrival. “Dissidents are being told not to show up at any of the pope’s masses. The government doesn’t want any trouble,” said Joaquin Torres, a Cuban journalist. “But unless you have been here it’s hard to notice. Repression in Cuba is very subtle. ” U.S. officials are seeking a low profile while defending the American embargo. “We have not tried to influence the pope’s message in any sense,” Michael Ranneberger, head of Cuban Affairs at the State Department, told reporters in Havana. Mr. Castro had wanted a papal visit for nearly two decades. John Paul finally agreed last year after the Cuban president met with him in Vatican City. In Santiago de Cuba, one of the cities on the pope’s itinerary, workers were busy Wednesday putting the final touches on a 30-foot-high bronze cross in the central plaza. Church members hummed a few of the tunes they plan to sing during Mass on Saturday. And the townspeople, some calling themselves both die-hard Catholics and determined revolutionaries, were jubilant. “Cuba has always been a rebellious, fiercely independent and friendly nation. Now it’s also blessed,” said Leonor Zallas Simon, a homemaker from El Cobre, a town just outside Santiago de Cuba. Temperatures in Santiago de Cuba soared into the 90s, not ideal weather for the pope, whose health has been increasingly delicate over the years. And even though the Popemobile is equipped with air conditioning, some Cubans said they were worried how the pontiff would adjust. “Someone should send an E-mail message to the heavens and request some rain clouds,” writer Rene Camacho said Wednesday afternoon. “It will be hot, hot, hot. ” Hours later, rain spilled from the skies and a magnificent rainbow appeared, an episode some locals quickly attributed to the pope’s historic trip. “A miracle,” one resident called it. 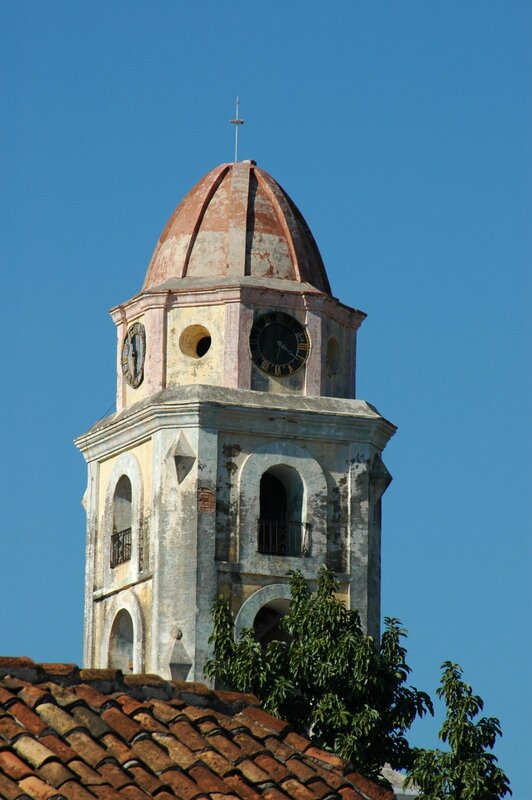 Tracey Eaton reported from Havana and Alfredo Corchado reported from Santiago de Cuba.